The slowing manufacturing sector hit its lowest point in two years last month amid a general downturn across the region. Oil prices were stable yesterday, largely maintaining gains from the previous session as Opec-led supply cuts and United States sanctions against Venezuela provided the market with support. Wirecard and its law firm said on Monday (Feb 4) that they had found no conclusive evidence of criminal misconduct by any employee of the company, after the Financial Times last week alleged financial wrongdoing at its Singapore office. SINGAPORE’S largest capitalised property developers, construction firms and real estate investment trusts (Reits) with a strong Singapore focus have made a solid start to the year. Is environmentalism in Singapore really happening, or are people simply buying an eco consciousness? Singapore’s indoor skydivers ended last week’s Wind Games in Empuriabrava, Spain, with three medals. This year’s River Hongbao kicked off on Sunday (Feb 3) night with a 10-minute fireworks display, the longest in the event’s history. Online retailers still struggle to gain market share, as shown by Redmart’s consolidation into Lazada and honestbee’s severed ties with NTUC Fairprice. 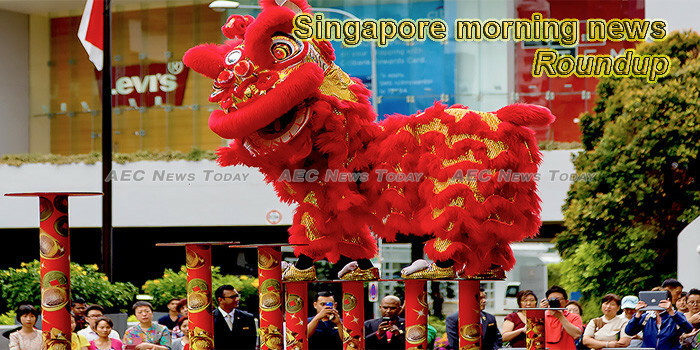 It is that time of the year for Chinese families to strengthen ties, and in multiracial Singapore, it is also an opportunity for other races to enjoy the warmth and hospitality of their Chinese friends and neighbours. MORE businesses are turning to technology to provide services to customers. This can be illustrated in the food industry where online marketplaces such as Deliveroo and GrabFood have made food delivery easier with the use of technological solutions. Malaysia seeks to talk things over with Singapore after the Lion City made a statement to ban all foreign vehicles with existing fines or unsettled traffic tickets. Public sympathy at all-time high. The Ministry of Home Affairs (MHA) says that when a person adoptsextreme political, religious or social views, they could be radicalised over time and may even want to engage in terrorist activities. You’ve probably got your hands full of Chinese New Year goodies and duties this week. No? Take some time to visit new exhibits up around town, from night tours at State of Motion 2019 to revisiting old flames with Off Centre. The Gojek driver in a viral video has been summoned by the Land Transport Authority (LTA) for an interview as a part of investigations after a complaint was filed against him. No one could say that Singapore Democratic Party (SD)’s Damanhuri Bin Abas is unmoved by SDP leader Chee Soon Juan’s recently published book, “Never on Bended Knees. A Christmas cabin that caught the imagination of Woodlands Housing Board residents has undergone a transformation just in time for Chinese New Year. Starting from 1 April 2019, foreign vehicles with a number of outstanding fines for traffic, parking or vehicular emissions offences may be denied entry into Singapore. This move, according to the Singapore Police Force (SPF), aims to strengthen enforcement of such offences. About 60,000 foreign vehicles enter Singapore daily. The stock market may not do well in the new year, according to Feng Shui experts. We take a look at the latest financial performance and valuation of Frasers Centrepoint Trust. PM Lee’s 2019 Chinese New Year message highlights how integration distinguishes Singaporean Chinese from the Chinese societies of China, Hong Kong and Taiwan, as well as overseas Chinese minorities in South-east Asia and the West. He was smoking in a Geylang local area network (LAN) gaming shop on Jun 20, 2017 when he spotted National Environment Agency (NEA) officers approaching him.